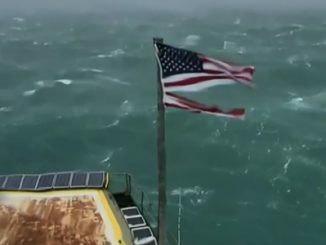 Mark Blake calls about his Led Zeppelin book, Matt Riley’s here to talk about Killer Cares, Eddie Vedder goes full “Paul Simon”, Francis Bean Cobain’s making music, Taylor Decker got his ball back and Ariana Grande is shooting up one of Drew’s list. Drew is a bit Bush 41’d out as his casket’s arrival in Washington DC takes over all of daytime TV. P may be the only member left out of ELP. Bring It on Home reveals that Jimmy Page liked to space out a bit too much & didn’t end up receiving writing credits for many songs. 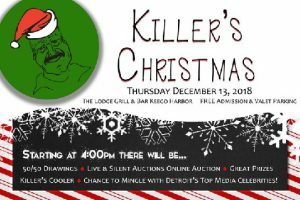 Matt Riley is in studio to plug the upcoming Killer Cares Charity Christmas Event December 13th at the Lodge Bar & Grill in Keego Harbor. Be sure to join us as Drew, Marc, Trudi, Maz & BranDon will be there bartending starting at 7pm. Marc had to explain time zones to Charlotte even though everybody knows that time is the same everywhere. Lest you worry, Michael Avenatti & Stormy Daniels have “sorted s**t out”. Trudi has been substituting for the WOMC morning show for a few days & has to wake up extra early to adhere to the strict dress code at the station. Cannabis will officially be legal for recreational use this Thursday December 6th, but the big bummer is there will still be nowhere to legally buy it till 2020. 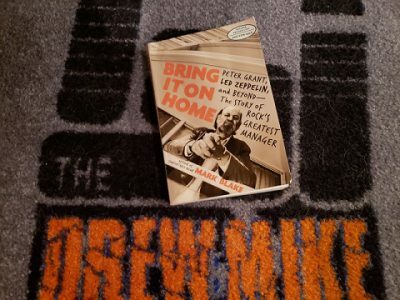 We’re calling Mark Blake the author of Bring It on Home the Led Zeppelin book that Drew’s been digging lately but due to some issues with tiny fingers we have some initial troubles before we manage to connect. The commenters on the YouTube stream for Global Citizen Festival have no idea who Eddie Vedder is and don’t want to see him impersonate Paul Simon. Final week for the fans to cast their useless votes for the Rock & Roll Hall of Fame induction ceremony & The Zombies are the leading fan favorites. Backdoor Teen Mom Farrah is back with a Cameo full of sage parenting advice for BranDon & Kristen. 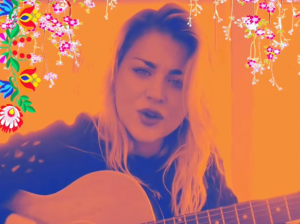 Frances Bean Cobain has released a new single with accompanying Instagram video that isn’t as terrible as you think it might be. Which ‘act’ would you rather see live, Frances Bean Cobain, Paris Jackson or Lisa Marie Presley? Remember that time that Elvis met The Led Zeppelin at a concert in 74′? In a coke snorting contest between Ozzy & David Lee Roth, put your money on DLR? Breaking News: Taylor Decker’s first touchdown football has been located & returned to him. The Rams game is still a loss though. Another person has come forward to report a beat down at the hands of free agent Kareem Hunt. Speaking of NFL beatdowns, LeSean McCoy’s case of domestic violence is still ongoing. Some dude that tried to intimidate two women by waiting on their doorstep ended up getting shot for grabbing them & refusing to go away. A Tennessee high school football coach moved a 14-year-old into his house to coach & mentor him, until the teen ended up banging his wife. Halsey called out Victoria’s Secret for not using plus sized or transgendered models in their Angel’s fashion shows. No word on whether or not she’ll return any money she made for performing at the event. Pete Davidson is suicidal-ish after Ariana Grande decided to cover up her green blob honoring his dead father who passed away on 9/11 with another green blob of Mac Miller’s dog. The Clinton’s latest money making tour is tanking hard. Meanwhile, Michelle Obama is selling out shows despite having guest stars that are less than desirable.